Every golfer who can play a lick, dreams of visiting Golf’s Hallowed Grounds in Scotland where the magic of golf was created as the most honorable and noble sport (in my opinion). But, our first visit eight years ago was a brutal humble learning experience for the entire Steier clan. 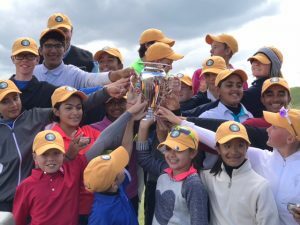 Back then, Joseph (age 10) and Jacqueline (age 7) earned a spot into US Kids World Championships at Pinehurst, NC and Scotland’s European Championship because they were playing pretty well on the South Florida Local US Kids Tour. 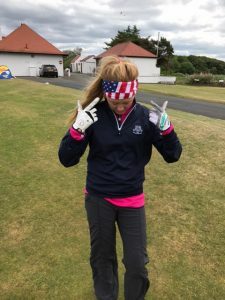 Jacks had actually earned “Player of the Year” so we decided to try Scotland and entered our kids into the European Championship in Gullane, Scotland on the North Sea. Keep in mind, our kids had never played a links course, never played in 30 plus mph winds, never been in thicket rough below knee high , never seen a pot bunker, never played in cold rain , never practiced a punch shot, etc. but we still went, making it an ambitious family vacation anyway. With gailing winds, little preparation, and a whole different game of golf, the kids really did not understand. We finished in the very bottom of our respective age groups with Joseph getting better every day but with Jacks threatening to never play golf ever again and in tears on the spot as winds almost knocked her over and a few pot bunkers. We were not sure she would ever made it out! We hung out in Edinburgh, an amazing city, for the last two days agreeing the word “golf” could not be brought up without a family penalty – and really enjoyed the history and the beauty. So golf became a fading memory during the rest of the trip. Earlier this year, Jacqueline and I started talking about going back for another shot but with a better plan, more prep, and an entirely different approach. And Joseph has aged out anyway. So we booked, but almost cancelled 10 times for various reasons. But in the end we agreed it was time to “bury the demons” once and for all! 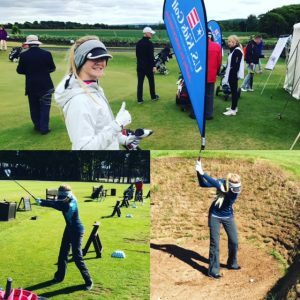 Well, this week, all the old frustration became joy as we practiced hard at St Andrews learning to bounce balls up, hit pit bunker shots by the hundreds, and learned to keep her ball stance more stable during high wind periods. We went to the course for practice round we booked by ourselves so we could hit shots from everywhere, and it worked! Playing on the sea, in rain the first day and putting poorly we carded a disappointing 86, but the next day Jacks shot her career low tournament round, 73! It felt like a 68 due to winds and a few tough breaks on bunkers we had to play sideways, moving her into 4th place with a round that seemed like a miracle! The last day, the winds kicked up to nearly unbearable on a few holes, but Jacks played even better and had it 2 over with a short tap in on 17 that turned into a temporary disaster and an emotionally frustrating 18 that gave 4 shots back to the field with only 1 and 1/4 of a hole to go. 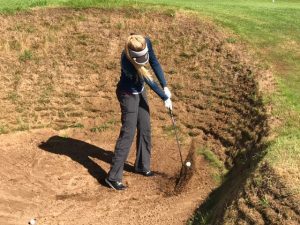 But her 78 was still second low because of the tough conditions at the Luffness New Golf Club in Scotland. There was a runaway 1st place player, Euphemie Rhodes, who out classed the entire field but Jacks 86, 73, and 78 earned her a 2nd place runner up finish which is a feat I am so proud of! To go from last, eight years ago to 2nd place this week was the best golf I have ever seen her play. 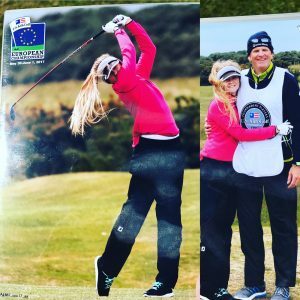 She just hit great shots 95% of the time against a solid international field and having the lowest American finish ever in the girls 15-18 division!. 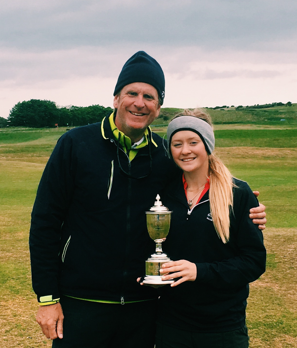 Due to the finish, Jacks earned a spot on the International Van Horn Cup Team where she fired a very solid 75 the next day at Gullane Golf Club, one of the five oldest courses in the world. She was on the winning European Van Horn Cup team, as well, despite losing her match, but making it a “break-thru trip” of a life time. We carried our runner-up European Van Horn Cup trophy through the airport like a deceased relative in an urn! The moral of the story – let’s always go BACK out and ELIMINATE our fears and take it on! It might be a new day, a new season, or you are so different now that this TIME it will be your conquering moment – like it was for Jacqueline! The “Compassion In the Workplace” event, in conjunction with the 17th Annual Louisville Festival of Faiths, will be held this Thursday, November 15th from 2:00 p.m. to 3:30 p.m. in Russell Hall at the Kentucky Center for African American Heritage, which is located at 1701 West Muhammad Ali Boulevard in downtown Louisville, KY.
Local business leaders who are known for their business acumen and their compassionate work settings, such as Bridgeman Foods CEO Junior Bridgeman, Spalding University President Tori Murden McClure and Signature Healthcare CEO Joe Steier and Signature Healthcare Vice President of Spirituality Dianne Timmering, will be special guests at this event. More details about the event can be found on the Festival of Faith’s website. There is such an organizational bias by many health care leaders that their approach to innovation, creative programming, and proprietary strategy is obviously the best route for their company because they may have helped author it. That may be a great way to have a homogenous battle cry that motivates closely aligned teams, but I often doubt if it creates many industry game changers that stick or grow. We have all been on the pulse of an organization where the command center operates like a one-way firehose to the field without interruption. I have fallen into that trap many times myself, when there is that “passionate rush” to operationalize top-down strategic opportunities that may have incremental impact at best.